High performance cleaners, rain repellants and surface treatments that provide drivers with the ultimate in improved visibility, safety and driving comfort in all kinds of inclement weather. Is a heavy-duty “scrub & flush” cream cleanser that deep cleans auto, aircraft & marine glass safely and effectively without scratching the surface. It removes all buildup of water spots, hard water minerals, insects, road salt, waxes, tree sap and road grime. It promotes clear visibility... and driving, flying & navigation safety. GLASS SCRUB also improves mechanical windshield wiper performance. Easily applied – as and when needed – it does not bond to or build up on the surface. 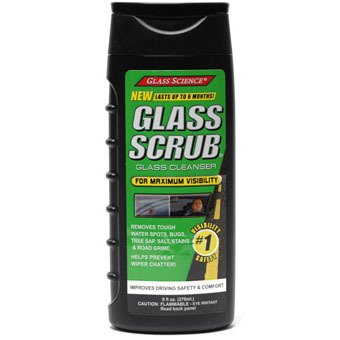 Glass Scrub is the perfect solution for deep cleaning all glass on cars, trucks and buses. Importantly, it is nonflammable, non-toxic to users and is earth safe. 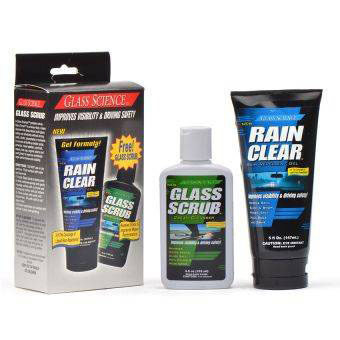 Advanced RAIN CLEAR liquid or gel provides a lasting water, soil & stain repellent coating on all exterior auto glass including windshields, side and rear windows, mirrors & lights for dramatically improved wet weather visibility, safety & driving comfort. Rain, sleet and snow simply "bead" up into small droplets and are swept away by aerodynamic wind flow for a clear view of the road. RAIN CLEAR also dramatically reduces the adhesion & buildup of frost, snow, ice, salt, mud, insects and road grime for easy removal and cleaning. For perfect car glass and a clear view of the road in any weather use Rain Clear! 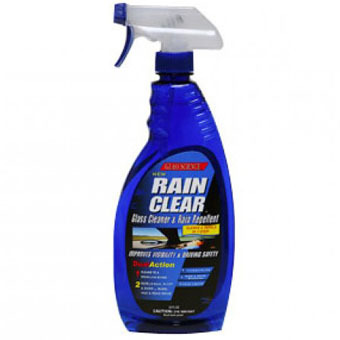 RAIN CLEAR GEL is highly concentrated VOC-free non-flammable and non-toxic.Easily applied like a polish, Rain Clear Gel will treat 3x the surface coverage of standard liquids. Can easily be stored in the Vehicle. GLASS SCRUB deep cleansing cream thoroughly strips the glass free of all contaminants by getting deep down into the pores of the glass. It effectively removes hard water, salts, spray wax residue, tree sap and rod film-without scratching. Glass Scrub makes the surface more water accepting (hydrophilic) allowing the wipers to run more smoothly over the surface improving performance.